Situated within the South Male Atoll, K. Guraidhoo Island features crystal clear water, white sandy beaches and lush greenery. Guests can enjoy in the island and on the sea. Is the mix of nature and Maldivian tradition, other concept of Maldives, the beauty of the reality. Featuring a terrace with seating area, air-conditioned rooms are fitted with tiled flooring, a wardrobe, telephone and ceiling fan. The bathroom comes with a hairdryer and shower facility. Free wifi is provideGuests may request for laundry services from the 24-hour front desk, while water sports activities such as fishing and a PADI-certified dive school are available on site. One of the restaurant and every hotels and guest houses in Guraidhoo will serve a great Maldivian and international cuisines... Best place to have a fresh fruit shake on the beach. 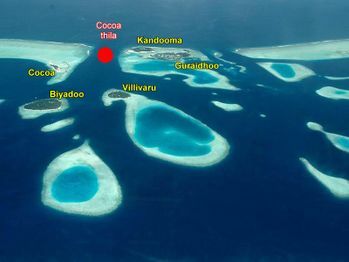 The island is within 28 km from Male International Airport, which is approximately a 45-minute speedboat ride away.